Ms Tagalong was, as usual, wandering two steps behind Mr Ideasman. 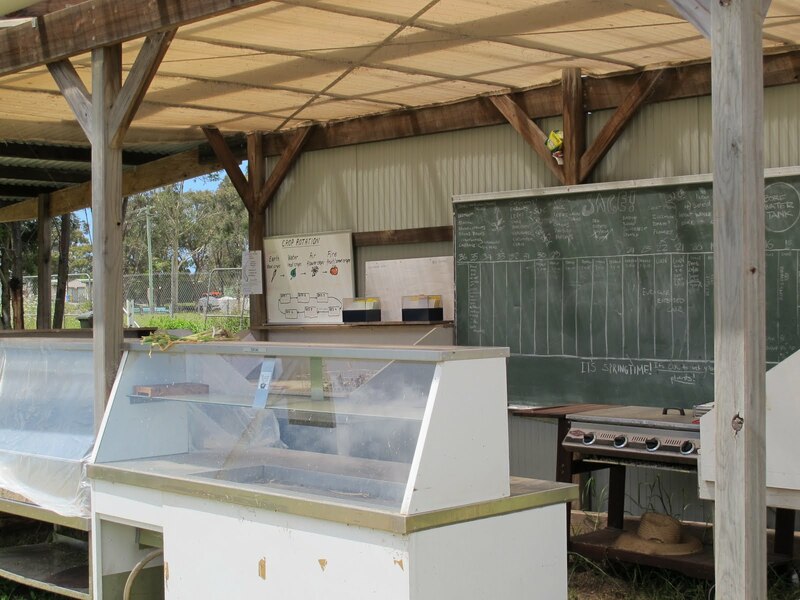 This time it was through Moruya markets, when she spotted a small stall with organic produce. 'Is there a community garden in Moruya?' she eagerly asked. 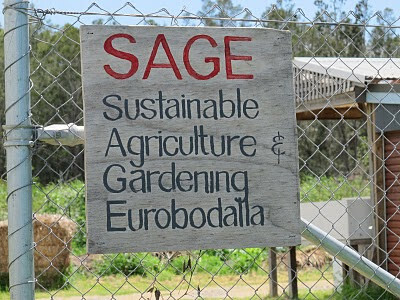 Sadly we declined but agreed to go and have a look at SAGE (Sustainable Agriculture & Gardening Eurobodalla) an enviable acre and a half just outside the town centre. Eat your heart out Treefrog Permaculture! Just the size for a city farm. Sage has the aims of increasing the quantity of locally grown food and 'growing the growers', returning this area to the market garden production it was known for. 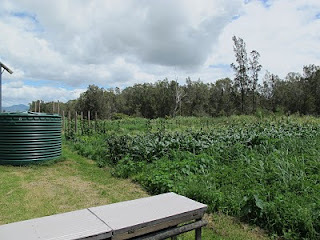 Using sustainable farming practices and the co-operation and assistance of TAFE (mm, could be an idea for us) the 'garden' is still in its developmental stages. We admired the rather grand crop of marrows and wandered around some of the smaller plots which the lady at the markets had explained were individually tended. The market had run out of basil to go on the lovely fresh tomatoes so Ms Tagalong was hoping to glean some and had just picked off the tips of some flowering plants when a striped lady strode purposefully towards us. Ms Tagalong clutched her illicit basil guiltily behind her back hoping the clinch wouldn't release too much of that undeniable basil smell. 'We're from Tighes Hill Community Garden in Newcastle,' we smiled. Mr Ideasman talked and we found out that like most ventures, there is a dedicated core. About 15-20 participants regularly attend the working bees on this most fertile flood plain beside the river. 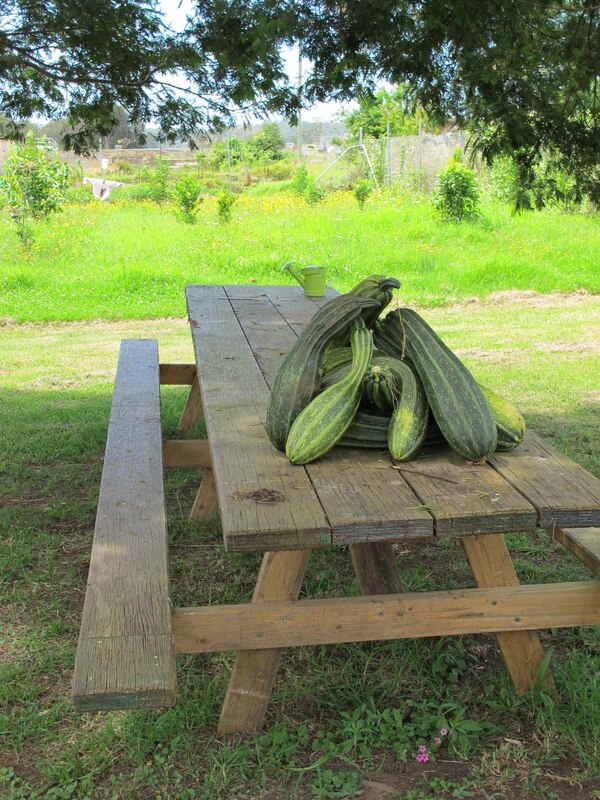 Mr Ideasman and I admired a prolific unknown crop and enquired as to what it was. Standing nearly 1 ½ metres high with light blue flowers and fruit something like a cape gooseberry it was certainly most impressive. Pity it was a weed! 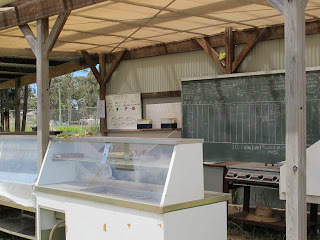 We spotted a solar-driven bore, a skeleton for a herb garden and an orchard. Once Ms Stripes had gone with her lunchtime lettuce we gleaned a few more herbs and a very small lettuce, honestly it was very small and they were all threatening to go to seed! Tiger prawns, fresh Italian bread, tomato and lettuce salad garnished with the purloined basil – a lunch fit for visiting community gardeners! 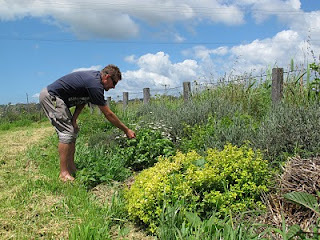 I am in the process of starting a communigty garden in carrington! do you have an email address that i could write to you on? 28th Jan is Cocktails in the Garden, so please come along and join us if you can.